Warning! Failure to read a written agreement is not valid defense! A well-drafted construction contract clearly sets out the work to be done, the price to be paid for the work, and the terms and conditions of payment. The contract should also designate various foreseeable risks between the parties. When the parties allocate a list of potential hazards, the contract becomes longer, but it reduces the risk of disagreements in “gray areas” that are not addressed at all – assuming that both parties take the time to read and understand the lengthy, dryly-worded document. You should be aware that all of the requirements of fundamental contract law must be met for a construction agreement to be valid. We will focus here on construction-specific applications of contract law. Construction contracts are often formed through the bidding process. The owner requests a quote or issues a more formal request for proposals, and contractors wishing to perform the described work respond with the price that they would charge. The contractor’s bid constitutes a binding offer, which if accepted, results in a legally enforceable contract. The acceptance of a bid is referred to as an “award” of the contract. In the case of private construction contracts (as opposed to government contracts), the property owner requesting bids is free to accept or reject any bid, regardless whether the bid is the lowest or most sensible one. Construction contracts consist of terms of agreement ranging from price and description of materials to be used to an agreement that any disputes will be resolved through arbitration. The owner agrees to pay a fixed dollar amount for whatever is required to complete the job, such as an agreed fee. If the contractor makes a mistake in the estimate for labor or materials, the contractor bears the loss. The contract is priced by the number of units delivered multiplied by a set rate per unit, such as an agreed rate of the $6.39/square foot for installing a hardwood floor. Contractors bear less risk under unit price contracts because an error in estimating the size of the job does not stick the contractor with overages. Under this arrangement, the contractor agrees to keep records of the costs of labor and materials. The owner agrees to pay for all the submitted costs plus a markup, which can be expressed either as a percentage or as a lump sum, such as an agreement that a contractor will install a hardwood floor and charge the actual cost of the materials plus 35%. If there is dispute regarding the price, courts will first attempt to determine which type of pricing scheme the parties agreed to use, determine which party assumed the risk of error or contingencies, and finally determine which party bears financial responsibility. At some point, you will probably find yourself wondering whether you should sign the contract in front of you. If you order items from a-door-to door salesperson, hire a contractor for a home improvement project, or go to work for someone as a consultant, you will be faced with a document, hopefully, designed to protect both you and the other party. Ideally, a contract allows the parties to define, in specific terms, the extent of their obligations to each other relative to the delivery of products or services and payment terms. When the contract is signed, it generally cannot be changed unless both parties agree. Consequently, it is important to protect yourself before signing a contract by understanding exactly what it is you are committing yourself to. Use the following list as a general guide. Make sure that contract terms are workable for you. If they are not, attempt to negotiate terms that are more reasonable. 1. 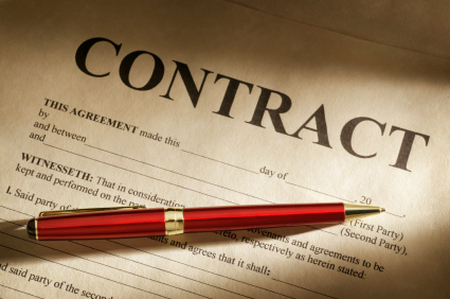 Know what you want: Know what it is that you’re entering into before you sign that contract. Make sure it is detailed and accurate to what you expect. Consider getting an attorney to review and redline the contract so that your interests are protected, especially if the project is a large one. 2. Get everything in writing – right down to the manufacturer, brand names, sizes, colors, etc. Review every detail to be sure it’s in your contract before signing. Should it become necessary to involve arbitration or the courts, the first thing lawyers will ask to see is your contract along with specifications and plans. Your home building or remodeling project will live and die by that contract! 3. Timeframe – The agreement should have a timeframe if any aspect of your transaction will occur in the future. If you are the party delivering the services or goods, make sure that you are allowing yourself enough time to complete the job. If you are the party receiving the products or services, ensure that the delivery schedule conforms to your needs. If you want to contract for month-to-month services, make sure that you are not signing an agreement that obligates you for a longer period. 4. Prices – The contract should clearly state prices. Be wary of additional charges that you have not discussed with the other party. For example, when you contract with a professional, you will often be quoted an hourly rate that will not include additional charges for things like photocopying and postage. Make sure you know what the other fees are and ask for an estimate. 5. Payment Schedule – Make sure that the payment schedule for your project is based on the contractor’s performance and is included in the contract. NEVER, EVER let your payments get ahead of the contractor’s work (apart from initial deposit). A “retention” is a percentage of each payment or the total job, ordinarily 10 percent, which YOU retain until the job is completed. 6. Payment Method – Determine the terms of payment and whether it is appropriate to your financial situation. For example, the contract may call for payments at the end of the month when the majority of your bills are due. You may also be able to negotiate installment payments if you cannot afford a lump sum. 7. Payment Penalties – Determine whether there are late payment penalties and if they are reasonable. 8. Get Warranties – Be sure to get any warranty offered by the contractor for labor and materials in writing. It should specify which parts of the work are covered and the duration of the warranty. Keep these on file. 9. Material Terms – If you and the other party have an understanding of the goods or services, make sure that the particular terms are in the contract. For example, if you have agreed to make a subfloor out of plywood, then it should be in the contract. This will help you make your point should the buyer demand OSB. 10. Insurance – Your construction contract must clearly cover your project’s insurance coverage. Usually, you include liability, and your contractor covers workman’s compensation. 11. Resolution Of Anticipated Disputes – No matter how careful you are or how good your relationship with the other party, a dispute may arise. Many contracts include an arbitration clause, which means that a dispute must be settled through arbitration as opposed to in court. Arbitration is less costly and less formal than court, but if you sign the contract with the clause intact, you have probably waived your right to take the matter to court. 12. Anticipated Problems – The party with whom you are contracting may have had prior experiences that have led it to add particular methods of resolution to the contract. Those ideas may be perfectly agreeable, but they could also be unfairly beneficial to the other party. Analyze whether these terms will benefit you. 13. Lawyers’ Fees – Determine whether you will be charged for the other party’s attorney’s fees if you breach the contract and lose the case that will probably arise to enforce it. If you are prone to breaching contracts, this is the kind of clause you should avoid. A quick question I was hoping you can assist me with; if a contract between a home builder and customer is signed but does not contain any dates (i.e. start date, completion dates etc.) is it still a valid contract?